I'm not doing a full post today because it's been a crazy couple of weeks, and time will not allow a more complete blog post. But, I did want to share my Thanksgiving table from today. I started with a new tablecloth that I found fortuitously at BBB on their clearance table for $6.00! I don't know why it was so marked down: the package was totally sealed, a 60 X 120 size and I just loved the leaf pattern and fall colors! I also found darling utensil holders. I've never used these little flatware pockets before, and it was fun filling them up and making them a part of my tablescape. My centerpiece of a cornucopia filled with leaves spilling across the table seemed appropriate for this theme as well. While rummaging through my fall bin I discovered brightly colored leaf candle rings that fit right in, and cuddled my crystal candlesticks! I have to give a "shout out" to my endearing Johnson Bros. Friendly Village dinnerware. I would be lost without these faithful dishes gracing my Thanksgiving table. I write this post at the end of a wonderful day surrounded by family : Hubby, four married daughters and their husbands, my eight grandchildren, my cousin, and my dear granddog who is ailing, yet still able to snuggle and warm our feet under the table. As I looked around at all the chaos and listened to voices of all ages ringing through the air, I couldn't help but mentally embrace the moment, and I wanted to hold the warm feelings that enveloped my grateful soul. It truly was Thanksgiving Day, and I do Give Thanks for all who shared this day with me and made my spirit soar. I hope everyone's Thanksgiving Day reflected these same feelings in your home! Now......we turn to the exciting days of greeting the Christmas season !! I'll be linking up to Susan's Tablescape Thursday at www.betweennapsontheporch.net and Christine's Dishing It! and Digging It! at www.rustic-refined.com. Please check out these wonderful blogs and enjoy all the creativity that is reflected there! I love to hear from you. Please feel free to comment and say "hi"! That tablecloth was a steal for $6! My table also takes a 120 in. cloth when fully extended. This one is gorgeous! I've always admired those Johnson Bros. dishes. 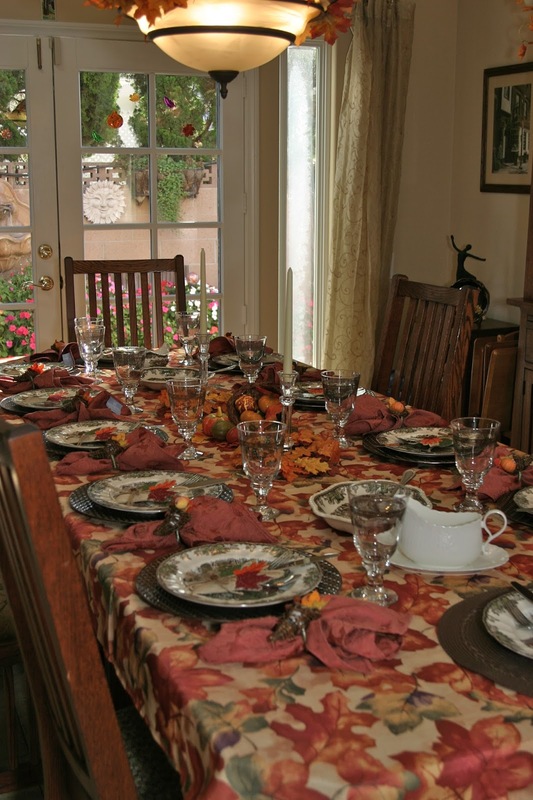 They just seem to set the perfect Thanksgiving table, evoking the quintessential holiday scene. I'm happy you had a wonderful Thanksgiving Day! We celebrated with family at my sister's home. We're looking forward to Christmas in our new home. Enjoy your weekend!! So beautiful. Glad you had a warm and wonderful day! Happy Thanksgiving Rosie, I am so happy to hear your day was full of family, blessings and love! Your table is beautiful! We don't celebrate with falling leaves in the east, too many falling in our yard! Bring on the holidays!